“Teganuma Triptych.” Watercolour, ink and charcoal. SENSEI: You are so young! That’s great. ME: Not really. I’m 48 this month. SENSEI: Nahh, you are young. ME: I don’ feel very young. STUDENT: You are both babies! I’m 84. I managed to “win” the National Novel Writing Month competition in November by completing a 50,000-word first draft of my latest Hana Walker mystery. I recorded a daily video too for folk interested in how to write a novel (Day 1 is here) but skip to Day 29 here to get my conclusions of what it’s like to write every day for a month. A far more manageable project is to write 300 words on the theme of Kyoto, in prose or poetry, before April. I’ll have a go at it, and you can too. Although, I don’t actually know anything about Kyoto, and have only been there once for a long weekend 20 years ago. This amusing Edo-period Japanese history of the US features George Washington battling tigers with his bare hands. Who says history is bunk? The Last Children of Tokyo looks like a great, short dystopian satire on Japan that if I wasn’t up to my eyeballs reading yakuza fiction in preparation for editing my latest novel, I’d be all over it. There’s a review here in Tank Magazine. I’ve been listening to a lot of audio books this year, the latest is the rather good Snakeskin Shamisen by Naomi Hirahara, reviewed here. This month, I’m going to try to dispatch this lot to hit my goal of reading 100 books this year. I found this great, gentle video on whether it is too late to learn how to draw (it’s not) and thought the advice that Kanzo offers is applicable to learning any new skill in life. You may not be particularly interested in listening to me prattle on about how I’m going about writing my latest novel, but here I go off on an extended tangent about Vermeer and Munch, whose exhibitions are in Tokyo right now, which if you have a chance, I recommend you try to see. The New York Times reckons it knows why Japanese are addicted to paper. I must admit to just skimming the article, but if the Japanese are addicted to paper I’m pretty sure it’s because a) hanko (name stamps) work better on paper than computer screens b) it’s just easier to tell the 92-year-old company president to use the fax machine than explain the concept of email attachments AGAIN, and c) they are not addicted to paper. Question of the month: ARE YOU A MEMBER OF A BOOK CLUB OR READING GROUP? I only ask as a fellow newsletter subscriber is looking for one to join to get more recommendations for good reads. To answer, just hit reply on your email and I’ll piece the bits together and post them next month for all subscribers to see. Last month’s question was: DO YOU KNOW OF ANY CONTEMPORARY JAPANESE AUTHORS NOT TRANSLATED INTO ENGLISH WHO REALLY SHOULD BE? GUY YATES: Not being that proficient in the Japanese language, my ability to uncover non-translated novels on my own is somewhat limited. I rely on checking out what my wife is reading. Problem there is she prefers to read English language novels currently. When she does return to her ingua franca then a novelist I often see her in are the works of Hayashi Mariko. Seems like Hayashi-san has a rather impressive output so the opportunity to read a few of her critically acclaimed would be welcomed. If any of your readership has come across her novels in English then I’d like to know. Other than that, I think I’d extend the question slightly to cover novelists already translated but not all of their work. An author in that camp would be Takagi Akimitsu. I’ve read his three currently translated works: The Tattoo Murder Case, Honeymoon to Nowhere and The Informer. The Tattoo Murder Case is the first of a series of novels which feature Detective Kyosuke Kamizu. The first was published in 1948 and I believe the last in 1994. That time span represents a significant period of time within Japan’s recent history which in itself could make the series more interesting to read: assuming his detective aged in line with the author’s publication dates that is. Thanks for reading, have a good month. And if you have enjoyed reading any of my stuff, be a sport and leave a review on Amazon, Goodreads or your own blog, or drop me a line on Twitter or Facebook. You can find past issues of this newsletter at Letter from Abiko. If you appreciate this newsletter feel free to forward it to a friend, post it on social media, or, buy one of my books. My watercolour study of a Maurice Utrillo oil painting (inset) featured in a book I bought from a Kashiwa Book Off for ¥100 last month. I’m doing NaNoWriMo right now. For those not in the know, that’s the annual National Novel Writing Month challenge to write a 50,000-word novel in November. I’m posting a brief YouTube video every day giving an update and advice for fellow travellers, writers and anyone curious about my third Hana Walker novel (code name The Yakuza and I). You can see the first video here. And please subscribe to my video channel at the end of any of my vids if that’s a thing you do. This horrific true crime tale reported on by Tokyo Vice author Jake Adelstein would make a great basis for a Japan noir/police procedural which I think could well become my next novel once I’ve finished the latest Hana Walker. I know it’s bad form to review your own books, but it was instructive for me to revisit and post reviews of my firstand second novels. I was honest in my appraisals, but obviously you should take the star ratings with a pinch of salt, as always. Some good pics here by photographer Hiroji Kubota who beats the Japan-land-of-old-and-new drum. The best Japan noir I read last month was this one, a tale from the POV of a yakuza henchman. This month, I’m hoping to get through this lot to have a chance of hitting my target of 100 books read by the end of the year. A tall order, given I’m trying to write a novel this month too. But a lot of the books have pictures, so I have a chance. British (or could fake it) and in Japan? Here’s a UK-government-compiled list of English-speaking lawyers, medics, interpreters, translators and funeral directors that let’s hope you won’t need, but are here if you do. It’s entirely possible that we have the American occupation forces (and the black market) to thank for the continuing popularity of ramen noodles in Japan. While looking through old stories that didn’t make it into this newsletter (but should have) was this New Yorker piece from August on John Hersey, whose Hiroshima book was an inspiration for Quakebook, btw. Question of the month: DO YOU KNOW OF ANY CONTEMPORARY JAPANESE AUTHORS NOT TRANSLATED INTO ENGLISH WHO REALLY SHOULD BE? I only ask because I have a good author pal in the UK who says his publisher is looking for Japanese talent to wow English speakers with. Can you help? Last month’s question was: WHERE IS THE BEST PLACE TO FIND ENGLISH BOOKS IN JAPAN, AND WHERE IS THE BEST PLACE TO FIND ENGLISH BOOKS ABOUT JAPAN IN OTHER COUNTRIES? MARIA GODEBSKA: Ohh… I miss Maruzen bookstore’s foreign books section which, along with Meidi-ya Fine Foreign Foods Emporium (not actual name) formed a regular shopping/loitering haunt for foreigners and Japanese alike, to buy expensive stuff, to bump into folks you know, and to kill time before the pubs open (this was back in the Nineties and Noughties, before pubs wised up to the idea of Early Doors). These stores both closed down some years ago, and it just hasn’t been the same. I get all my books on t’interwebs. I also stopped scouring my subscription newspapers, journals and magazines for book reviews a long time ago, so I am undoubtedly missing out on some fabulous books. A quick ink sketch of Our Man in Yokohama Baye McNeil I did Friday night. I was quite touched that I got a couple of messages from concerned subscribers that their monthly Our Man in Abiko newsletter hadn’t arrived. Well, that’s because I decided to release the newsletter more regularly, in fact, at High Noon Abiko Standard Time on the first Sunday of every month, and it just so happens that today is the first Sunday of this month. Perhaps, I should have told you about the new plan. Sorry about that. Look out for the newsletter on the first Sunday of every month from now on. I enjoyed reading newsletter subscriber and Tokyo professor Michael Pronko’s latest crime thriller The Moving Blade, released last week. And I think you will like it too. I asked Prof P. if he could make a few review copies available in the library for fellow Our Man in Abiko newsletter subscribers (that means you) and he graciously agreed. Just drop him a line at michaelpronko@gmail.com and tell him I sent you. But hurry, he only has three copies left. This month, I also really dug Naomi Hirahara’s fifth in her seven-part mystery series set on the mean strawberry fields of California’s aging Japanese community. Worth a listen as audiobooks too, right from book one. From tomorrow, I’m re-writing the first draft of the third (and final?) Hana Walker novel. This has been complicated by my computer dying and taking with it to its offline grave 50,000 of the 70,000 words I’d written but failed to save anywhere else. Sigh. I have six days off this week, so aim to get the new first draft done in a stream of consciousness. And coffee. But according to John Cleese, it will be better than the original. Watch my, er, progress on a daily video diary here if you enjoy wonky prose and even wonkier camera work. Glenn Kardy, scourge of newsrooms on both sides of the Pacific, finally found his feet publishing manga for non-Japanese. He talked to me about 20 years of running the Manga University publishing imprint. This was the best translated-from-the-Japanese police procedural I read last month. This month, I picked up this haul of Japan thrillers from the Abiko library to sink my teeth into. If you are into Zen Buddhist art and Dad jokes (if they subscribe to this newsletter, that’s a given – ed), this Tokyo exhibition might be your cup of green tea. Looking for an editing job in Tokyo? There are a couple of vacancies here as posted by Loyal Newsletter Subscriber Alex Brooke. Question of the month: WHERE IS THE BEST PLACE TO FIND ENGLISH BOOKS IN JAPAN, AND WHERE IS THE BEST PLACE TO FIND ENGLISH BOOKS ABOUT JAPAN IN OTHER COUNTRIES? Last month’s question was: WHAT PUTS YOU OFF READING A BOOK THAT YOU ARE JUST ABOUT TO BUY OR BORROW? GUY YATES: Never judge a book by its cover so they say. But that’s the typical way I judge it. If the packaging doesn’t look professional then what hope for the contents? Sure, I may have missed some classics but based upon last month’s question you posed I hope to pick those up in other ways. I also need good presentation within the book. If care and attention has been taken here then I’m happy to assume similar level of care was taken by the author over their choice of words to place within this. LINDA LOMBARDI: Here’s a problem that often puts me off a book I’m considering buying – and it’s a totally modern issue – it’s when the Kindle sample isn’t long enough for me to feel I’ve gotten a fair taste of it. I think the problem is different with novels as compared to nonfiction or comics/graphic novels. As far as I can figure out, the Kindle sample is an arbitrary percentage. This means that with nonfiction, sometimes all you get is a long table of contents and front matter and then like two pages of the book, and with comics because they are short in comparison (and maybe the file size for the graphics plays into it? ), you might get just one or two pages. I’ve also encountered situations where all you get in the sample is the introduction to the book, sometimes written by someone other than the author. Basically sometimes the sample clearly just doesn’t make any sense at all and it’s clear no human was involved in choosing the cutoff point. With novels it’s sort of different – you’ll almost always get a decent amount of the actual text, at least. But if the book doesn’t move like a bat out of hell right from the start, sometimes I don’t get enough of a feel for it. What’s particularly concerning about this is that the obvious solution for authors is one I don’t want to see happen! You could solve that problem by making sure your book jumps into the thick of things right away at the start, but I don’t think all books should be written that way. It’s often not that I’ve lost interest in the book because it’s too slow at the beginning – just that I need to know more to make a commitment. Which of course would be possible if I were in a bookstore holding a physical copy but that’s not a world I live in anymore. Obviously, a book cover has been designed to fit a certain genre and attract a certain reader, but if (for example) the book is described as steampunk – a genre I like – and has a bodice-ripper cover, then even if the bodice is clockwork, I will pass. I also pass if the story is set in historical Japan, because the cliches and errors would probably irritate me too much. If the blurb contains certain overused words, like someone being enigmatic or inscrutable, spunky or perky, it’s a no-no. I don’t mind “cosy” mysteries, but reject “clean” ones, which is, like “God-fearin’ “, the author’s rather smug way of telling people they don’t have any dirty words, dirty deeds, or dirty thoughts. I am also irrationally put off by odd names, so if the main characters are called Pip or Raven, back the book goes. If I am buying online, I am also swayed by negative reviews. When checking reviews, I look at the overall ratings, then skim the first page of 5-star reviews, then skim the 1-star reviews. I know, I know, that this is terribly unfair, and I try to remember that not all reviewers are honest or even real, but still – I will go back to the same book a few times if it gets a good newspaper review or has been recommended by a friend, but if the low-star reviews mention a problem in the book like lots of typos, or characters making stupid decisions, I will leave without a purchase. Thanks for reading, have a good month. And if you have enjoyed reading any of my stuff, be a sport and leave a review on Amazon, Goodreads or your own blog, or drop me a line on Twitter or Facebook. If you appreciated this newsletter feel free to forward it to ONE like-minded friend. My old man has been encouraging me to write a memoir of my four years spent working at small town newspapers in Arkansas back when Bill Clinton was president and scalpels and hot wax machines were how we cut and pasted news stories together. I’ve been making a little headway in a long-term project to develop an editing sideline to my writing, publishing and teaching business. In the short-term it is focussing my mind on how to write good fiction. Here, I explain how to edit a novel, as best I know. I’m quite chuffed that I created probably the only pages in English on the internet about Japanese fine artist Tatsuo Shimizu. It has been an honour to get to know Tokyo-based British marketing consultant Matthew Dons, he kindly gave a 4,000-word interview to me and spelled out more wisdom on book marketing than I’ve heard in years of listening to self-publishing podcasts. If you get some value from the interview, please consider donating to his cancer treatment fund. This was hands down the best thing I saw on Twitter last month — a moving letter a man wrote his grandson answering questions about his experiences in the postwar occupation of Japan. Hat tip to Our Man in Saitama, loyal subscriber Daniel Fath. The best book I read last month was this one. I quite fancy reading this Belgian mystery set in Hiroshima.If anyone gets to it before me, let me know what you think of it, please. What I’m reading this month. 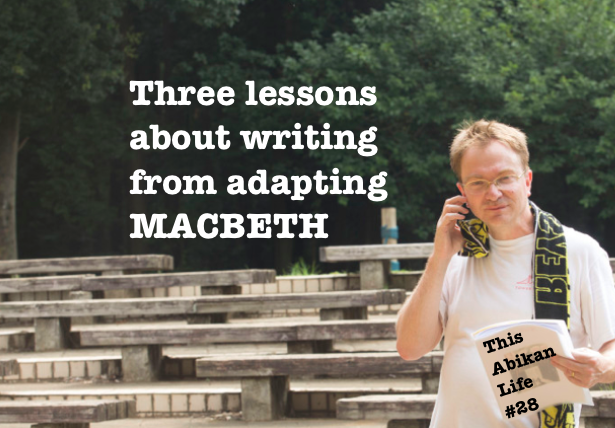 Click on the picture below to see me talk about three lessons I learnt about writing from adapting Macbeth for Japanese schoolchildren. I didn’t mention in that video that Yokohama Theatre Group’s Andrew Woolner popped over to Abiko and gave the kids (and me) a fantastic lesson in how to do Shakespeare. He’s putting on an original show all about migration with performances from September 15th to 17th in Kawasaki which I plan to attend. Details here. Rest in peace Chibi-Maruko-chan manga artist Momoka Sakura. And Tokyo Weekender journalist James Bailey. Question of the month: WHAT PUTS YOU OFF READING A BOOK THAT YOU ARE JUST ABOUT TO BUY OR BORROW? Is it a silly blurb? A poor cover? A bad review? A description of the weather in the first paragraph? Speaking as a self-publisher, your answer would be most valuable to me. Last month’s question was: How did you hear about the last book you read? LARRY PIPER: I was reading a book, and there was a reference in it to someone voraciously reading the Betsy-Tacy books, so I thought to check them out. I find a lot of books that way, for example a reference in “The Grapes of Wrath” led me to reading “The Winning of Barbara Worth” (which turns out to sort of a prequel to “Grapes of Wrath”). Whatever, back to Betsy-Tacy, I thought, perhaps I’d gotten on to that series from reading “A Tree Grows in Brooklyn”, but that book was published about the same time as the first volumes in the Betsy-Tacy series, so it doesn’t seem all that likely. On the other hand, I can’t figure out anything else from my recent reading. The next closest match would have been “Peyton Place”, but I’m almost certain I put Betsy-Tacy on hold at the library long before I downloaded a copy of “Peyton Place”. Are you as confused as I am now? JK: I usually find out about books via the New York Times book section. MARIA GODEBSKA: I belong to a book group on Facebook, where all manner of wonderful books are recommended. However, foolishly, I have been avoiding those in favour of free ebooks from a site called Instafreebie. You can get as many downloads as you like, of full novels or sample chapters, by self-published authors. So, all I have to go on when selecting a book, is the genre, the cover, and the brief bumpf I click on. The quality has been hit-and-miss – you get what you pay for, and sometimes not even that since you had to spend time if not money. If I like the free one, I go and see what else they have written, and hand over some honest cash. The last two books I read were both books I bought for a couple of dollars after reading an Instafreebie work by that author. Hit: “A Beginner’s Guide to Invading Earth – Book 2” by Gerhard Gehrke. I enjoyed the first, and I enjoyed the second. i wish there was a third, but it doesn’t exist yet. Miss: “April Fools Humor Box Set” by Lee J. Isserow. Bought after enjoying a short story called “Testing Ground” by Lee Isserow. The writing style is so vastly different, I have to wonder if the authors are as well – is that initial J. more significant than I had imagined? Anyway, I am dabbling in unrecommended works of unfamiliar genres by unheard-of authors far more than I ever have before, and the hits are (mostly) worth the misses. LINDA LOMBARDI: I heard about the book I’m currently reading, as well as the last two that come to mind, on Twitter. GUY YATES: I’m currently reading le Carré’s A Most Wanted Man (nearly through my summer reading list). I would have heard about this book from reading his earlier novels. How I got on to le Carré in the first place is more difficult to pin down. I guess from my mother as she was always happy to provide suggested reading to me (she got me on to Colin Cotterill’s Dr. Siri series). Outside of family recommendations I resort to a couple of RSS feeds: Crime Fiction Lover and Euro Crime. Mainly scour those for new authors who look to have an interesting story to tell. More recently I’ve tried to make more of Twitter (I removed myself from Facebook a while back and this is my last link to social media). I follow author’s of interest (including your good self), reviewers of interest and more recently translators. Through them I am getting wind of other interesting books, authors and podcasts. The latter is a window into the authors through their own voice which is most interesting. Only yesterday I picked up on a new (to me) podcast: Partners in Crime (http://partnersincrime.online). This seems on first blush a good one to be subscribed to. Thanks for reading, have a good month. And if you have enjoyed reading any of my stuff, be a sport and leave a review on Amazon, Goodreads or your own blog, or drop me a line on Twitter or Facebook. You can find past issues of this newsletter at Letter from Abiko. If you appreciate this newsletter feel free to forward to a friend, post it on social media, or, perish the thought, buy one of my books. Abiko salutes your sacrifice. Next month, I’m going back to college… I’m interviewing the brains behind Manga University. I knew the French woman was dead the moment I saw her naked body on a backstreet in Kanda-Jimbocho. Finding mself free on Saturday afternoon I thought it would be a pleasant diversion from the hustle and heat of the Yamanote Line to forget about squeezing myself onto the next train out of Nippori back home to Abiko and instead get off at Kanda, make the 10-minute hike up the hill through the snowboard shops billowing air conditioned cool onto the promenades… and lose myself among the secondhand bookstores that dot the backstreets behind Yasakuni-dori. I used to eat my ham-mayonaise-French-mustard sandwiches under the shade trees of the shrine to the imperial war dead that the main road was named after, that was when I was a fresh-faced English-teacher-for-hire to Japanese salarymen around the time the bubble burst, back when there used to be a Berlitz language school at Kudanshita, across the road from the Budokan, where the Beatles had once played. Iidabashi, the French quarter, was just out of sight, over the crest of the hill, where once upon a time I’d sit on prolonged smoke breaks with my French-teacher buddy, Loic, sipping black coffees and imagining glorious futures. He might have known the dead girl. But that was surely impossible. He was French-Canadian, not French-French. And besides, that was getting on for 30 years ago now. My thoughts were interuprted by the earsplitting sound of a Japanese crooner warbling a wartime tune in homage to the emperor, back when he was a god, and I glimpsed the black truck speeding down the main road. The nationalists like to remind us foreign residents of Japan of our place at uncomfortable volume. I wondered if the driver hated the French too. Even their beautiful women? A single white tofu-van trundled up the hill against the flow of traffic, but from its tinny speaker John Lennon was imploring us to imagine all the people. I was trying, John, I really was. But it was becoming increasingly embarrassing for me to gaze at the French woman’s spread-eagled body. I furtively flipped the black-and-white pages over and checked the publication date — 1953. Then it could mean only one thing. The pin-up girls staring imploringly at the camera must all be dead now, every last one of them. The book slid silently back into its place at the back of the bargain bin, and I hurried across the road for an ice cafe au lait. I interview loyal newsletter subscriber Martin J. Fridabout his new book, “Kamikaze to Croydon,” that I edited and designed the cover for. Read the interview. You might even like the book. And if you think you might, Martin has authorized me to send the first five people who reply to this email a free copy of the book that you can read on any Kindle or phone with a free Kindle app. So, hit reply to this email pronto if you’d like a copy. Friend and equally loyal newsletter subscriber Matthew Dons received some bad news in his battle with colon cancer. He could really do with some cash to prolong his life. I hate to ask, but I’d hate even more not to ask. This YouTube trailer for the Japanese film that won in Cannes, “Shoplifters”, looks good (yes, I know, I’m always late to the party). I’m still plodding my way (enjoyably, it has to be said) through the late Alan Booth’s masterful Japan travelogue “The Roads to Sata,” but all hail Our Woman in Nagoya Maria Godebska who linked to this gem, a TV documentary interview with the man. The books I’m planning on reading this month. I somehow missed the anime boom in Britain in the early 90s, but three fine chaps didn’t. And they started a podcast, Otaku on Writing, to revisit the anime classics and steal the best ideas for their own fiction. Worth a listen. Apart from saying Asterix instead of asterisk, there are no amateur mistakes at all in this video I made about the three steps necessary to turn a manuscript into a published book. At all. Honest. Rest in peace Shinobu Hashimoto, the last of the Kurasawa screenwriters. Question of the month: HOW DID YOU HEAR ABOUT THE LAST BOOK YOU READ? My reason for asking is I’m getting a handle on editing and publishing fiction, but marketing it is still a foreign country to me. Time to do some original research, thought you might be able to help. Last month’s question was: Have you read any good mysteries or thrillers set during sporting events? GUY YATES: I’ve been scouring my brain and not striking much. The only one I read was The Bomber by Liza Marklund. The story centred around a journalist tracking down some crime or another but there was in the backdrop an Olympics that had been awarded to Stockholm. Set in the relative present though…and I think it may have been a winter Olympics. Was a good introduction to the author’s work and she has plenty more in the series to work through. I do, however, have a sport-related one on my to read list which may well be of interest: Off Side by Manuel Vazquez Montalban. Our mutually enjoyed author Mr. Camilleri homaged his detective’s name on the Spanish author. In Off Side, Barcelona’s new soccer star is receiving death threats and Pepe Carvalho, gourmet gumshoe and former political prisoner under Franco, is hired to find out who’s behind it. What is not to like, huh? Thanks for reading, have a good month. And if you have enjoyed reading any of my stuff, be a sport and leave a review on Amazon, Goodreads or your own blog, or drop me a line on Twitter or Facebook. You can find past issues of this newsletter at Letter from Abiko. If you appreciate this newsletter feel free to forward it to a friend, post it on social media, or, perish the thought, buy one of my books. Abiko salutes your sacrifice. Next month, I’m planing to publish an interview on book marketing with newsletter subscriber and marketing whiz Matthew Dons, which I know now will be worth your time. Postcards I bought of paintings by Seiji Togo on permanent display in the 42nd-floor Togo Memorial Sompo Japan Nipponkoa Museum of Art in Shinjuku, Tokyo, on Sunday. One of the advantages of living in Abiko, 40 minutes by rail from Tokyo, is you have a 50/50 chance of finding a seat on a rapid to Ueno. Two stations along, at Kashiwa, the odds dwindle to maybe one in 100 that among the press of pensioners, salarimen and high-schoolers you can find a seat. At all stations after that you can safely assume you’ll be standing, barring an act of God. So it stuck out in my mind when a white-tufted man in his 70s eased himself up from his corner bench seat across from me and gestured to the younger woman standing in front of him to take his seat. What made his act even more surprising was the woman had been engrossed in conversation with her two middle-aged female friends who were also standing. The man could have safely kept himself to himself and no-one would have blamed him. Cue a lot of restrained bowing. And while I couldn’t hear what was said, I could guess. So the older man stood and the younger woman sat. But this meant her two friends were left standing. A cloud crossed the face of a middle-aged salariman who now found himself sitting next to the newly seated woman. How could he remain comfortably seated when a 70-year-old man and the woman’s two female friends were standing? He could not, and with an ironic smile and shrugged shoulders, he struggled to his feet, hoisting his briefcase from between his knees onto the luggage rack above. After the perfunctory refusals and insistences, the second woman sat. By now of course, all eyes in the carriage carefully, but perceptibly, fell on the next person seated along the bench, a high school boy who, looking along the train could see standing a white-haired man, a middle-aged salariman and a woman. He promptly shot up to allow the last of the three women friends to take his seat. My latest project this month is editing a traditionally published Japan-based author’s first novel that I’m helping him to self-publish. The working title is “Kamikaze to London.” See me here talk about the editing process (from my divinely windy bunker). As of writing this, all my favourite teams are still in the World Cup, but given that there can be only one winner and it probably won’t be England or Japan, let me share with you this month’s freebie, a short science fiction/fantasy story I wrote on the occasion of Leicester City’s 5000-1 odds against victory of winning the 2016 English Premier League. There are worse ways to spend 12 minutes. This was the best Japanese mystery I read last month, but if you are looking for something unrelated that you can read again and again, may I suggest this. Loyal OMIA newsletter subscriber Matt Dons chats on the Learn Japanese Podcast about Japan travel tips. Roland Kelts gets to grips with post-Murakami Japanese writers here, seeing their angst with modern life as more universal than the US identity politics schtick. These are the books, many of them liberated from the amusingly titled Book Off secondhand bookshop chain, that I’m planning to read this month. This looks like a good samurai flick, if such things tickle your fancy. I’m in the throes of adapting Macbeth for a kids’ performance here In Abiko. So I listened with interest to Nordic noir star Jo Nesbo’s adaptation here. Really good. Really not for kids. A freeware Japanese dictionary with 180,000 entries? Read all about its founder here. Question of the month: HAVE YOU READ ANY GOOD MYSTERIES OR THRILLERS SET IN SPORTING EVENTS? I only ask as I’m thinking the Tokyo 2020 Olympics would make a fantastic backdrop for a murder mystery or two. Last month’s question was: WHAT NOVEL WOULD YOU PRESCRIBE FOR SOMEONE TO COPE WITH LIVING FAR FROM HOME? LARRY PIPER: Not quite what you were asking, but close. When my brother — a real writer not just a “published author” like me (no one counts things in the Journal of Chemical Physics as real writing) — found out that I was to visit Japan for the first time, back in 2000 I believe it was (the year Takatoriki incongruously won the Haru Basho), he had me read James Clavell’s “Shogun”. He figured it would get me up to speed on Japanese culture. TONY KEYES: “On the Road” by Jack Kerouak. JULIE KUMA: Last month’s question about my summer reading: “Manhattan Beach,” by Jennifer Egan (hefty at 500 pp., but it really intrigues me and I’m looking forward to reading it. MARIA GODEBSKA: I can’t think of a novel that fixes problems, but I find that travel books – be they fact or fiction – are a great balm when feeling weighed down by Life: “I am away from home,” you think, “so I shall read about other people being away from home”. I can’t recommend any in particular, just whatever grabs your interest, and not necessarily travel books related to the place you’re from. The one I read most recently was “100 Days of Solitude” by Daphne Kapsali, who spent a year living and writing on a small Greek island. She ended up making her daily blog into the book. I read it because it was cheap on Kindle, and because all the negative Amazon reviews which slammed her for being too into herself, were by men. Nobody likes an uppity woman, eh? I have also read books by people travelling through Japan, and while they can help with objectivity, a too-perky traveler can bring you down. Case in point, I wrote to Josie Dew after reading her books about cycling through Japan and other countries, when I was being a bit negative (this was back in the 90s or early 2000s). I asked her how she managed to be so [expletive] positive about it all… She wrote back, and was ever so kind, and didn’t once call me a moaning Minnie. Alan Booth, although he wrote about 1970s Japan, was perfect for me – he walked the length of Japan, met a bunch of people, drank with them all, and was a bit testy. I would never consider that kind of activity – especially the walking and meeting people bits – so his books are an enjoyable read. I have also found mountaineering books a greatly uplifting (forgive the pun) read. Don’t get me wrong – I have absolutely no interest in mountaineering or indeed any extreme sport, none whatsoever, but after I reluctantly started to read “Touching the Void” by Joe Simpson (it was a gift from my brother, and had lain unread for too long, so I thought I oughter give it a go), I was gripped. All of his books are fantastic, as are (for me) all mountaineering books, and after reading all of his, I moved on to other books about and by mountain climbers. Another good one is by Jon Krakauer, who wrote about the 1996 Everest disaster: “Into Thin Air: Death on Everest”. So, I would say, read something that has nothing to do with you and your life and your problems, be they homesickness, difficulties adjusting, or what have you. Get out of your head and into someone else’s (but not in a creepy way). GUY YATES: I think the closest I would get to books which would take me back to England given my reading tastes would be Ben Aaronovitch’s “Rivers of London” series or Christopher Fowler’s “Bryant & May” series. However, both of these series are primarily London-based so they’d only get you back to the capital. But in their defence they do have comic books of the series too — but tracking down a copy of the Bryant & May one at a reasonable price is proving somewhat challenging. I mention this as comics would ultimately be my recommendation to someone living far from home: a good comic book or strip to immerse yourself in. And for that reason, what’s not to like about the Calvin and Hobbes strip? In times of need, I am always happy to revisit their escapades. They certainly have a choice of words which puts many a problem back in its right perspective. Next month, I hope to nail Macbeth for a Japanese audience and live to tell the tale. I asked my wife a difficult question last month. “Is this a joke?” she said, not looking up from her phone. She actually fixed a weary gaze on me, before returning her attention to her phone. I got a message back from Mark almost immediately. This month’s freebie: I re-published a guide to how to write a novel if you’ve got a budget of close to zero on my website here, and it wasn’t just any novel I used as an example, it was how I wrote Year of the Talking Dog. If you were one of the 109 people who downloaded it for free last month, thank you, you might get a kick out of reading the post. Oh, and a review of YOTTD would be most welcome on Goodreads or Amazon (nothing is truly free in this world, as I’m sure your mother has told you). I bought a first edition of the late, great Alan Booth’s Roads to Sata the last time I was in Kanda-Jimbocho, Tokyo’s secondhand book Mecca, and then Our Woman in Nagoya, aka Maria Godebska, found out there’s a new Booth book out. JT review here. Agent Maria also uncovered this history of the man and his writings, and a Facebook appreciation group here. You can buy the latest book here. Another great Japan-hand, who’s still with us, is Ian Buruma. Peter Tasker wrote this fascinating review last month of Buruma’s latest, A Tokyo Romance. This was the best book I read last month. This month.I’m going to tackle some or all of these books. I might have to make room for Cult X, a Japanese crime thriller recently translated into English, but at 512 pages I may just content myself with this Crime Fiction Lover reviewfor a while. The Our Man in Abiko Twitter Feed of Note Award goes to Ako Kitamura who consistently posts useful Japanese language tips and amusing language asides such as this one. And while I’m on language, Our Man in Cape Cod, aka Terry Gallagher, revealed this intelligence on the joys of using a robo-translator in Japan. Voice from the bunker: I did a 15-minute video on the secrets to being a successful writer (imagining that I was one for a moment). I’ve been thinking about such things because I’m about to edit a newsletter subscriber’s first novel. More news on that maybe next month. I read this great jazz-art-themed literary mystery by John Harvey and found he recommended 30 favourite crime fiction novels to read here. Question of the month: I saw this great article in the New Yorker about prescribing fiction for particular problems in life and it made me wonder, WHAT NOVEL WOULD YOU PRESCRIBE FOR SOMEONE TO COPE WITH LIVING FAR FROM HOME? Last month’s question was: What are you planning to read this summer? I like birdwatching and have read the first two in this series quite some time ago. So looking forward to reacquainting myself. Getting good reviews and spending a week in Iceland during the summer. So I put two and two together. For all the Scandinavian crime I read, I’ve yet to have read a Petrona Winner. Just finished his Dying Detective novel which I enjoyed tremendously. His style of writing is one I like in as much as he writes a little ahead of himself then fills in the detail. Much like le Carre in that sense. Our Abikan host is catching up on me so need to keep ticking off the series. Also a quick read. Living in Denmark I need to read more crime fiction set here. A new author (pair) for me this time. No idea how I missed this one. Just caught it on a Tweet recently so it needed to be read. Part of a summer theme of reading Japan based non-fiction work. Not sticking to the theme of reading Japan based non-fiction work. Getting near to the end of reading all his work. Final one in the series of an enjoyable British Noir series. The series is quite brutal and not for the feint hearted. So perfect for the beach methinks. I have a signed by the author original first edition and I need to read more actual books. So just like unboxing those Thunderbirds toys, I’ll lose some secondary market value on reading this one. I’m hoping for great things from the author – a la Ms. Rowling. An author I enjoy but tend to forget. His O-land series were a joy to read and then I found he had a stand-a-lone for me to enjoy. Daughter of Leif and this year’s Petrona winner. High hopes that the writing skills stay in the family. If I too want to read 50 books this year I’m going to need a few of these shorter novels in the list. Simenon did write a few of these I understand! I think I read this previously and I rarely re-read novels. Though set in Japan, if it’s the book I did read I initially picked it up for entirely different reasons than the fact it was set in Japan. * “Tamago” is Japanese for “egg”. It also sounds like “time ago”, and this is why it is funny. If you’d like any other jokes ruining for you with literal explanations or long, tedious set-ups, I do hope you think of me.